YESSSSSSSS, finally its World Champs time! The BIG WEEKEND IS HEEEEERRRREEE! I know I’ve said it before, but I do think it’s more of an achievement to win a series than to be the one who got it right on one day, but it’s Rainbows up for grabs and the one race lottery is the way it goes. 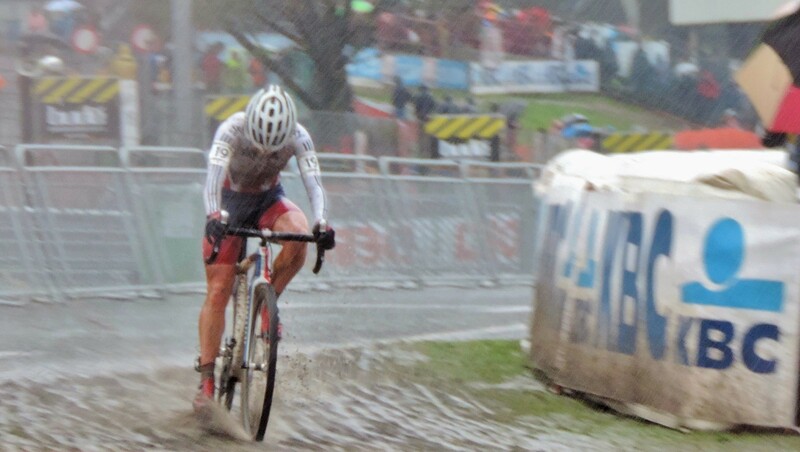 It’s also the weekend where we meet riders who have not ridden in Belgium before or who ride other disciplines and, for some reason, decide to get their CX on. A couple of The Guys have taken Rudi’s mobile home to the course on Friday so I’m travelling alone. I decided to travel both days rather than get an hotel room and arriving at Hasselt station I joined the group waiting for the shuttle bus. As it was the first bus of the weekend I was prepared to give them some leeway, but gosh did it take an age to get us all on board! Come on, mate, the racing starts in less than an hour! It was a ‘bendy’ bus which means those at the back get thrown around quite a bit and it seemed they were ready to party; “whooping” with every bend and the road bumps were a hoot! Fair to say we were all super-excited. After piling off the bus we walk to the entrance. I was expecting to get my bag searched, but the only question was whether I was coming for one day or two so that I got the correct colour ribbon and the chaps behind the ribbon guys were just to secure it on your wrist! Oh well, we weren’t unduly bothered that anyone would bomb us. Wonder if the good folk at UCI marketing (Is there such a thing?) 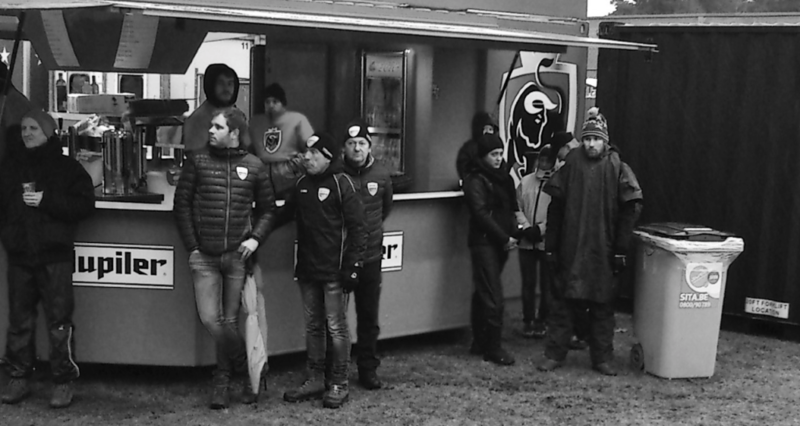 ever thought to give a discount to or special CXWorlds gift for anyone going to a number of World Cup events in the season? So here we are once more at Circuit Zolder. The weather forecast for the weekend is rain and lots of it. The clouds are getting warmed up and giving us a little taster. How glad am I that I remembered to pack my big yellow ‘Kevin’ poncho (see AFI Koksijde). Heading to the beer tent for coffee and I go past a rack of the usual burger and friets stalls and the booths to change your money to tokens. It also appears that they are charging to use the toilets! Is that even legal? I know there was a charge at the Belgian champs, but I thought that was for charity. Was I wrong? Plus that was 30cents these guys are wanting 2.50euros! I counted 5 beer tents in total, plus the UCI VIPs, cos, you know, Belgians like to be drinking of the beer and eating of the friets! In fact, you remember the Cyclocross Experience Simulator Home Edition? https://youtu.be/PSzfXDj_1fg All stereotypes apply (apparently!) Maybe some of those lovely Czech food stall folk could have come too, just for a change. I chose beer tent number 3 for coffee and LO AND BEHOLD! The Guys are here! No time for chatting though, the Juniors are already being called to the start. Yeah, Saturday is ‘Ladies Day’, but we have to start with the boys. I look forward to the day when the first race is the Junior girls. So we head out to the course. 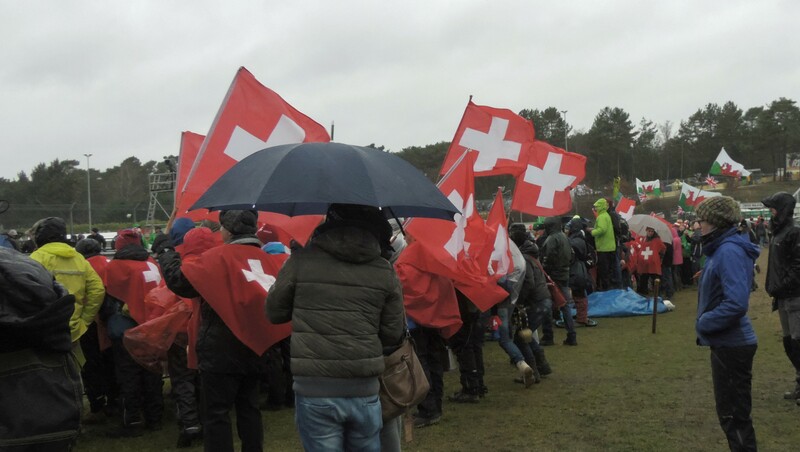 It’s great to see so many groups of supporters from other nations and the Swiss, Welsh and French have come to enjoy themselves. And is it a good omen to get a GPON so early? 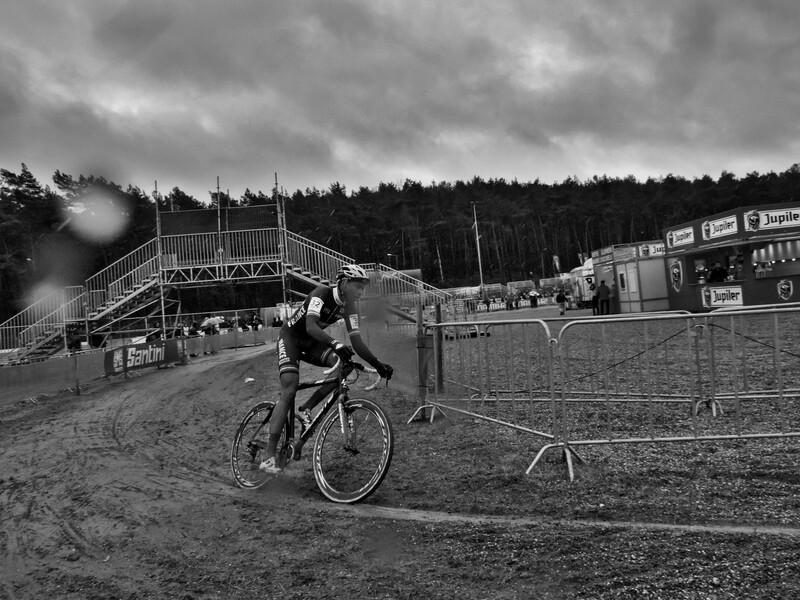 I didn’t get a good look at the course before this race, but there were a few changes from the World Cup. I didn’t actually notice the bridge behind the grandstand last time, but apparently it was there. Thankfully the access to the hill for spectators was improved with another set of scaffold steps, but then the bottom of the steep run-up was now reserved with only UCI VIP access! There are a couple of extra bridges for spectators to get over the course, which is great as there has been a decision that once the race starts all course crossings are to be closed for the duration. There are a couple more screens except at the extreme ends of the course. So to the Juniors. Throughout this season it has more or less been a duel between Jens Dekker and Jappe Jaspers. Last week in Hoogerheide they both had the same points in the World Cup and previously at this course they were leading together by a long way before a fall damaged both their chances allowing Tomas Bonnet in for the win. But was that a fluke or not? It was raining a bit more by now, but Jens Dekker was on a mission from the start. As I understand it, Jappe was a bit sick and was really struggling so despite sideline encouragement he was not going anywhere near the podium today. Mickael Crispin, as one of the strong French team that had delivered their man to the win before, has not really shown himself to be a star and I thought he was there in a support role, but as the race played out, he found himself in 2nd spot with a gap forming behind him as he chased Jens Dekker. I wonder if he was in two-minds whether to chase the leader or to wait for Tomas Bonnet? If there were team orders it wasn’t obvious so I give a whole rack of CHAPEAUX to the french team with a 2nd and 3rd, but there was no beating Jens Dekker. By this time the Belgian Weather Gods, being capricious bastards, decided that they had been generous enough all season so it was time to give up all the rain they’d been saving! 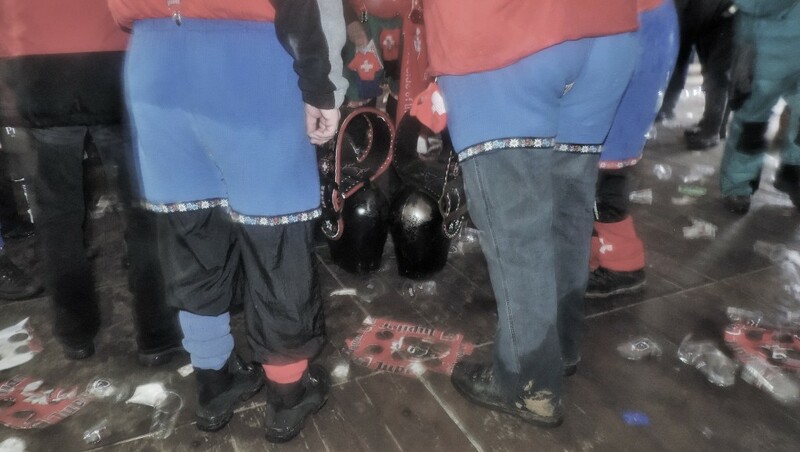 We all headed for the beer tents while the Swiss celebrated the 4th place of Kevin Kuhn with much more cowbell than anyone else can muster! Time for a nice warm coffee and to get the yellow poncho out then it’s back to the racing. The first ever Women’s U23 race is a really big deal and I sure don’t want to miss it, but it’s at this point that the Weather God’s really got stuck in. Some people have said that there wasn’t much support. I assure you there was, but we were all trying to stay out of the worst of the rain. I was shouting and cheering as much as the next person, but I doubt they would’ve heard from where I was or through the rain drumming on their helmets. And who is Evie Richards? No idea, but I do hope we shall see her again now that she has some Rainbows to show off. I can’t leave this without mentioning the motor-bike. 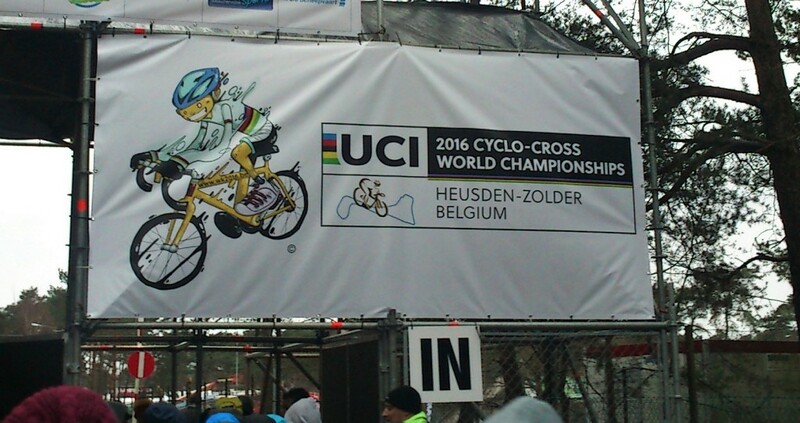 I didn’t see it and I didn’t see the UCI taking away a bike. I may have alluded on previous occasions as to the Bogan-ness of CX, but it would appear that the Family van den Driessche might give Bogans a bad name. Check your Urban Dictionary and decide for yourself. By the time Evie Richards, Nikola Noskova and Maud Kaptheijns were on the podium my feet were floating inside my boots so back to the beer tent for us lot (as if we needed an excuse). Trying to dry off a bit and appreciate the partytime can be tricky. The French fans were fantastic with the dancing and flag waving, but then came the Swiss men with their BIG BELLS. I tried to get a video but my phone only wants to do that when I don’t want it to and my camera, having got a bit wet, was steamed up and really not focussing on anything at all! This is the bit about Worlds that is great. All the CX nations having fun together. If I had thought more about it I might not have even bothered to take the camera and been less burdened by stuff. Next year… It would have been nice to have somewhere to sit too, what with being soaked through and wet camera and wanting food and drink. We had these simple things in Tabor. Jeez! I’m having a right old whinge! That’s what being cold and wet will do to you, eh? Let’s get to the main event of the day, The Elite Women. On paper this was a wide open race. Having won plenty this season and being in Belgium, Sanne Cant was probaly the favourite, but last week in Hoogerheide Sophie de Boer was on form and Thalita de Jong came through for a 2nd place result. Nikki Harris has been in the mix much of the season as has Caroline Mani and Eva Lechner, Pavla Havlikova and Helen Wyman have also had wins this season. In the world cup race here at CXmas Katie Compton pushed Sanne Cant all the way. In the commentary booth Marianne Vos was tipping Thalita de Jong and I find myself wondering why there isn’t on-course betting. The rain has eased off a bit so I left The Guy’s and headed to cheer at closer quarters to the racing. From the off Sophie, Sanne, Nikki and Caroline were setting the pace and after the first lap they had established a gap back to Thalita. 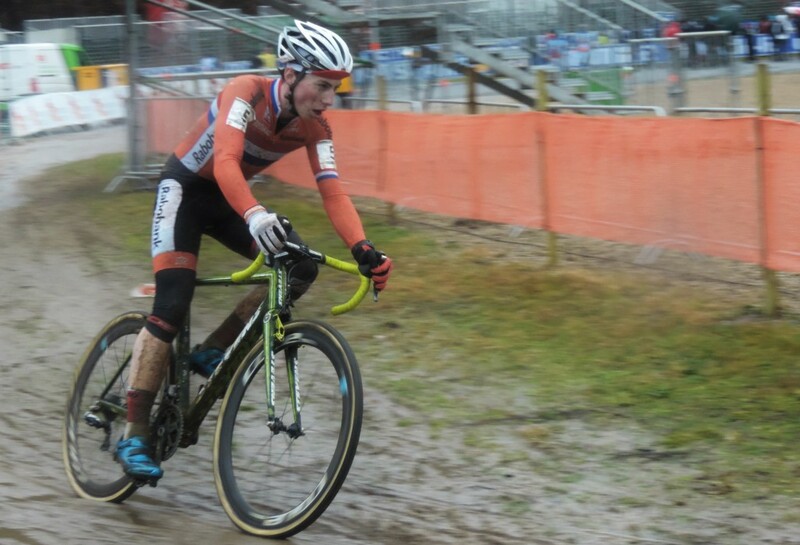 They weren’t having to ride through the enormous puddles that the U23’s had, but the mud was thicker now and the downhill treacherous. Quite a few needed those inflatable barriers! I got talking to a woman who purported to be Belgian although she lives and has a north country English accent. After I had just got through telling her that Thalita was a bit like a bull in a china shop next to Nikki Harris last week and that if she gets the technical stuff sorted she will be really, really good, she makes the junction to the front group and then she’s off. Sanne Cant has to dig really deep to stay in touch. Sadly for us, she did not have the strength left and Thalita left her behind after the pits and the grandstand off camber. Alas, for Sanne again, Caroline Mani really worked the uphill and took the second spot away. Yes, I do feel for Sanne Cant. She works really hard all season. She is a brilliant ambassador for the sport, She turns up every week and gives her best. I would love to see her in Rainbows. Perhaps her sponsors will want this too and maybe she can have a little rest to be fresher for Worlds next year. Tomorrow is another day, as they say, so now it’s time to head back. On the bus I got talking to a young man who has been working with Start-box.be and studying journalism (I really must remember to ask people their names!). He said he couldn’t go the racing tomorrow as he has exams. If his writing is as good as their photos he will be passing with flying colours. If you don’t know their work check it out on Twitter, Facebook and website. These guys really know their stuff. So, back home, dry out clothes and equipment and do it all again tomorrow. Congratulations to Jens, Mickael and Tomas to Evie, Nikola and Maud and to Thalita, Caroline and Sanne. Let’s do it all again next year in Luxembourg! 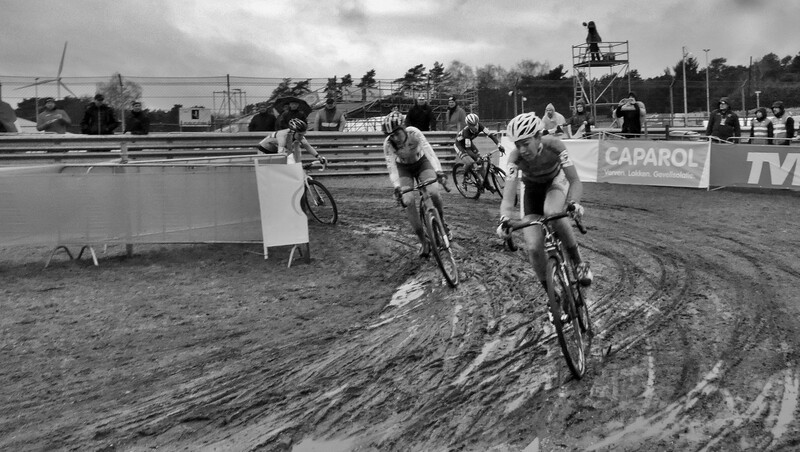 Thank you Cat for giving us a tape-side (and inside the tents) view of euro cross! And thanks Bill for posting these, they’re almost better late now that we are in the fallow part of the season. Takes me back!